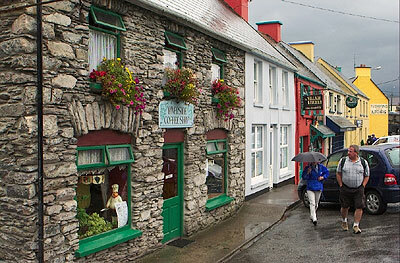 It was a cold and rainy day when we arrived in Sneem, but in this village you don’t need sunshine to cheer you up. 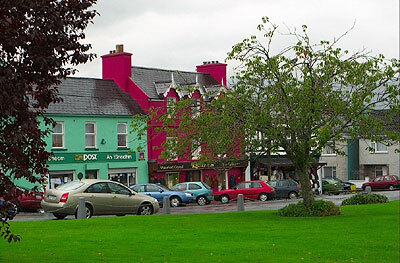 The bright and cheery colours of the buildings in Sneem more than makes up for the grey skies. Sneem is situated on the estuary of the Ardsheelaun River. This picturesque village has a beautifully kept village green surrounded by brightly painted houses and shops. This village relies on tourism for its income and there are plenty of quaint little cafes, tea houses and gift shops aimed at the tourist trade. The whole village appears to be engaged in the effort to make this place pleasing and welcoming for tourists and its efforts have won Sneem several National Tidy Town Awards. There are no important buildings or monuments to see in Sneem – its one bronze statue is that of Steve ‘Crusher’ Casey, a local who was a fearsome world heavyweight wrestling champion. Sneem’s attraction lies in its relaxed atmosphere and its close proximity to some fine mountain and river scenery around the Ring of Kerry. Some of its famous visitors over the years have included Charles de Gaulle, George Bernhard Shaw, Andrew Lloyd Webber and Charlie Chaplin, to name a few. Sneem was our lunch stop and those in the tour who signed up for lunch went to the Bank House for their meal which I gathered was sandwiches and home made scones. But for us, it was time to check out the colourful buildings and take more snaps of this charming village. Sneem village is certainly a nice base from which to explore the region, but if you are touring the Ring of Kerry in July, beware of the Sneem Family Festival which is a five-day event of fun and madness. No doubt accommodation will be difficult at this time and the peace and serenity of the village will be displaced by laughter and hilarity. One of the main events of this Festival is a National Wife Carrying Championship!